SRSR offers both scenic and whitewater floats. The stretch of river that we float starts from just upstream of Clayton, Idaho, and ends at Corn Creek (about 160 miles to choose from), passing through the towns of Challis, Salmon, North Fork and Shoup. So where ever you may be planning your vacation along the Upper Salmon River, we can help plan your float. We offer half day, full day, or Hot Springs scenic floats and full day whitewater floats. We can plan a float to fit your schedule. Our scenic floats are appropriate for almost any age level and are the perfect trip to introduce young (and old) to the fun of rafting. For all float trips SRSR provides: 1 guide /raft, lifejackets, a cooler with water, and a dry bag for each boat. A snack and beverages are provided on half day trips; a lunch and beverages are provided on full day scenic and whitewater trips. 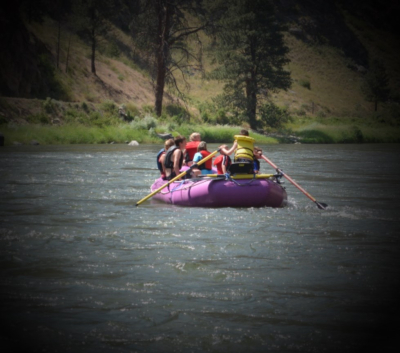 Add rafting with SRSR to your list of things to do when you are in the Challis area for your retreat, family reunion, or when you are here for Braun Brothers weekend . Salmon River Scenic Run has also been a sponsor and participated in the River of No Return Endurance Run Ultra- Marathon . So relax and enjoy a quick float with your fellow runners, before or after the big run! Items to bring: sunglasses, sunscreen, sandals or footwear that can get wet, light jacket, hat, camera. You are also welcome to bring your own drinks. Give us a call before you leave! !